DAN AUERBACH "Trouble Weighs A Ton"
Those Pecknolds can do just about anything. Head Fleet Fox Robin Pecknold, he of the majestic voice that's totally inappropriate for a 22-year-old (read: we're jealous), has again enlisted his brother Sean for directing purposes, and it turns out that he's pretty damn talented too. 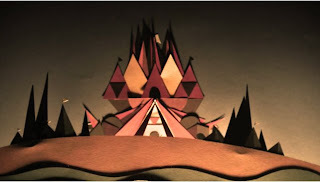 Sean and team spent the last four weeks working on the stop-motion video for "Myknonos,"from the band's Sun Giant E.P. from last year, and it keeps in theme with recent On The Blog Reels in that it's, you know, pretty and stuff. I would love to see what the rest of that family is like. Meanwhile, Dan Auerbach, he of the Black Keys and very recent Short Takes adoration, is letting us inside his Akron, Ohio studio for an intimate performance of "Trouble Weighs A Ton," the first track on the brand new Keep It Hid. He's also keeping it in the family by playing the song with his uncle James, who it turns out taught young Dan how to play guitar and sing! Thanks, Uncle James. Check out both videos and a special behind-the-scenes feature about the making of "Mykonos" after the jump.